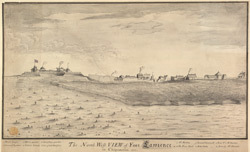 View of Fort Lawrence near Amhurst in Nova Scotia. This area was one of the first to be explored by European settlers and Fort Lawrence was built in 1750 by the leader of the British expeditionary forces Major Charles Lawrence. The British were hoping to establish a presence in the French territory of Beaubassin, previously known as Chignectou. After evicting the French from their Fort at Beau Sejour, the British demolished Fort Lawrence on October 12, 1756 barely six years after its construction.